THIS IS A 1972 FERRARI 365 GTC/4 WITH 26,722 MILES. 12 CYLINDER AC CAR BOUGHT IN 1980 AND WAS BEING CHANGED INTO A CONVERTIBLE. PROJECT INCOMPLETE AND IS BEING SOLD FOR A BARGAIN. IF YOU CAN FIX UP THE CAR, IT IS TRULY A BEAUTIFUL CAR AND WILL BE A PRIZED POSESSION IN THE YEARS TO COME!! AUCTION STARTS AT $19,999 OR JUST BUY IT NOW AND OWN THIS BEAUTY FOR JUST $34,999. http://www.ebay.com/itm/161623243332 by Collins Bros Jeep in Texas (Dennis Collins, buddy of Richard Rawlings from Gas Monkey Garage) with a $129,000 Buy It Now. This car is a unique opportunity to own an early V12 example of a Ferrari with a 5 speed transmission, this 365 GTC4 has been in long term storage for many years now and has only just been uncovered. Before being moth balled the car was taken back to its rolling shell for a re-commissioning, all interior, gauges, clocks, roof and mechanism, lights and trim were removed to start the process. The roof was also removed and was predicted to be a convertible car after its restoration. The odometer in the gauge cluster reads 26722 miles and believed to be true, but cannot confirm this. The car is in solid condition as you can see from the pictures, and comes with an array of genuine Ferrari parts to help the new owner finish the restoration off on this car. Some of the list includes, NOS front bumper, front grille section, all glass for doors including quarter units, full hydraulic roof mechanism with pump and rams, both under hood air cleaner assemblies complete, full gauge binnacle, window regulators, gas struts for hood, wiper motor, arms, arm rests, glove box door……….. the list goes on, I think you get the picture………. Even the windshield is brand-new and has just been placed in the front with tape loosely – a big money item this. The motor is complete and was running back in 1986 when it went into storage; it turns freely by hand now so we have no reason to believe there are any issues. The car also comes with a complete exhaust system and brand new correct tail pipes. Please look at the pictures clearly, this is a full restoration project and requires much work, if you have any questions please do not hesitate to contact us. The prices of these cars are rapidly rising above the $365,000 mark in the present day market for a “Driver Quality” example, so this car shows a fantastic opportunity for the astute investor. This car shows incredible value and a genuine rare opportunity to acquire the car of the moment in today’s collector car market. There are 3 options for the next owner, find a roof and go back to stock 365 GTC4, secondly continue with Spyder conversion these look great as a Spyder, third turn into a Daytona Spyder front and rear clips are provided (fiberglass), NOS rear Dayton bumpers, some of the lights pictured and the top bows. There are two sets of top bows with this car. 1 for 365GTC4 Spyder conversion and the other came with the Daytona rear clip. We price our cars to sell and this Ferrari will have a new owner in the near future. Worldwide shipping is available, Clear Texas title. This may be the last opportunity to own a 365 V-12 5 spd series Ferrari in this price range. Sold AS IS no warranty all sales are final. Payment due within 72 hours of auctions end. 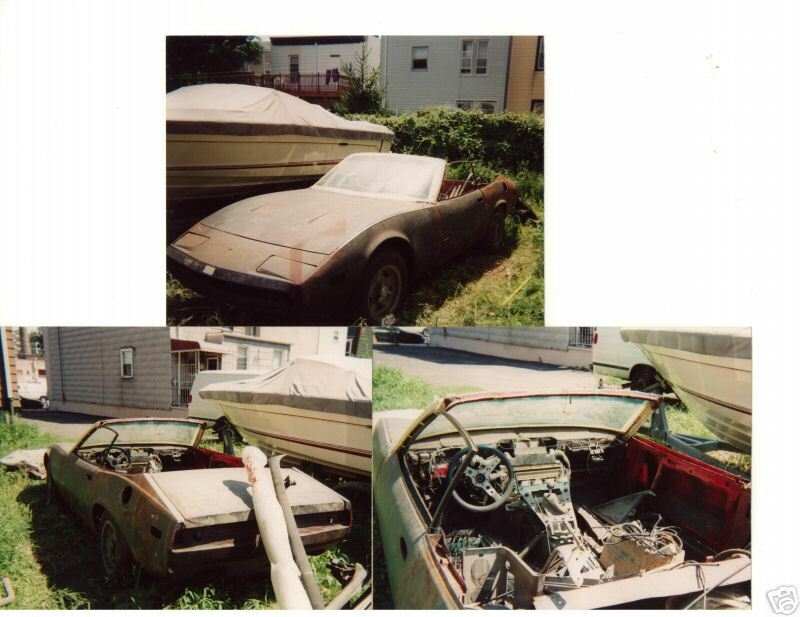 https://bringatrailer.com/2015/01/31/re-coupe-project-abandoned-1972-ferrari-365-gtc4-spyder-conversion/ This 1972 Ferrari 365 GTC/4 (chassis 15493) was pulled off the road sometime in the 80’s and partially dismantled as prep for conversion to a Daytona Spyder. Described as solid and largely complete, 27k recorded miles are believed to be accurate and its 4.4L Colombo V12 still turns freely by hand. Put into storage and not touched for nearly 30 years, we’re glad it was never fitted with phony fiberglass Daytona end caps and might even have most of its dignity salvaged via fitment of a carefully built replica roof. Find it here on eBay in Wylie, Texas for $119k OBO. ?Primer and bare metal has soaked in plenty of surface rust, underneath which bodywork looks reasonably straight with no apparent rot. Unfortunately the original steel roof sounds to have been discarded, though an NOS front bumper, grille and all glass including a new windshield are included. ?A hydraulically operated power roof mechanism including pump and rams are also included, but we’d sell them off immediately and put the proceeds towards partially recouping steel roof fabrication costs. Good looking OEM seats and a complete instrument binnacle with gauges are included, though no word on whether the rest of the interior also comes along or has been lost to time. ?Even covered in 29 years of dust and grime with socks stuck in its carbs, the lovely quad cam V12 still looks impressive. Hopefully its moderately low mileage and free-turning internals means it can be put back to running order relatively inexpensively, though we are talking vintage Ferrari here so “relative” is the operative word. A complete exhaust is also included, though there’s no word on the whereabouts of its transmission or the health of its suspension and brakes—both are almost certainly in need of refreshing. ?Our advice? Sell the top, kit car nose and tail, bang together a roof, respray it dark blue over re-trimmed black leather and drive it every opportunity.